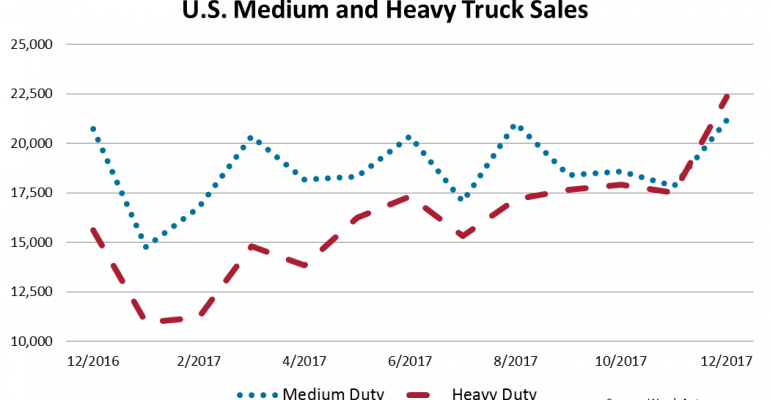 Single-digit increases defined U.S. retail sales of medium-duty trucks in December and for the full year compared with year-ago periods, WardsAuto.com reported. Sales of Class 4-7 trucks reached 22,045 in December, up 4.1% compared with 21,179 a year earlier. Year-to-date, sales rose 6.5% to 237,303 compared with the 2017 total of 222,790. “We are still in an expansion cycle in the medium-duty space. We have just had very moderate, sustainable growth since 2010,” one analyst said. Municipal fleets have been one of the dark-horse growth drivers over the past year, he said. Rising real estate values have pumped money into government coffers. “That facilitated clearing the backlog of demand,” he added. Sales of Class 7 trucks were up 1.4% for the month and 3.6% for the year — posting totals, respectively, of 5,519 and 63,828. Class 6 sales were the exception to the modest gains. All truck makers but one in the crowded space posted increases for the full year. These sales rose 10.1% in December and climbed 12.9% for the 12 months — to 5,913 and 71,626, respectively. 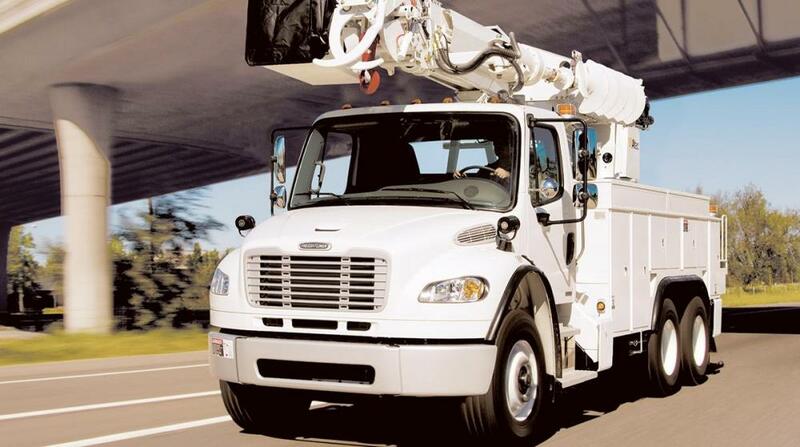 The biggest year-over-year gain in Class 6 sales occurred at International, a unit of Navistar Inc. It saw sales climb to 16,118 compared with 13,232 a year earlier. “So many of these medium-duty vehicles are service-based. If you look at the economy this year, just the top line, the service portion of the economy actually outperformed goods-based performance,” the analyst said. Sales of Class 4-5 trucks inched up 2.4% in December to 10,613 and 4.2% in the 12-month period to 97,715. KS: Is there a publication that breaks down truck sales by model. and also what fleets bought what. Jim, this is my barometer. There "should be" a publication that states fleet sales in the US, but I'm not sure. Class 8 sales fall 0.2% in 2017 while all other classes post gains. U.S. medium- and heavy-duty truck sales hit 43,534 in December, 24.3% above year-ago’s 36,365. With seven months of consecutive year-over-year gains, big trucks ended the year at 415,042 units, 3.5% ahead of like-2016’s 400,996. Class 8 sales posted a 48.5% gain, a third December best, to 22,355. The push wasn’t enough to equal last year’s total of 192,662, with 2017 falling 0.2% short to 192,252. Segment leader Freightliner almost doubled its volume, reaching 8,504 deliveries and accounting for a 38.0% market share. Volvo was the only truck maker in the group to underperform in December, down 12.8%, outweighing sister brand Mack’s 5.8% gain. That left Volvo Truck down 4.5% for the month. Medium-duty truck sales totaled 21,179, a 6.1% bump compared with year-ago’s 20,736, ending the year up 6.9% at 222,790 deliveries. All medium-duty classes exceeded 2016 sales, topped by Class 4’s 30.7% increase to 18,690 deliveries. Class 7 deliveries jumped 14.1% with large volume gains from Freightliner (+27.9%), Ford (+65.2%) and Kenworth (26.6%). Freightliner accounted for a 46.7% market share for the year and ended 2.5% above year-ago with 29,256 units. Class 6 was the only sector to finish below year-ago. Deliveries totaled 5,385 units, down 5.0%. Segment-leader Ford was the main downward force, with sales plummeting 39.3% from 2,883 units to 1,685. Runner-up Freightliner’s 49.0% bounce to 1,640 units wasn’t enough to offset Ford’s decline. Chevrolet’s LCF entered Class 6 for the first time in December with 7 units. Freightliner also clinched the No.1 spot in this class for the year with a 32.9% market share. Class 5 pulled off a 3.7% gain thanks to Ford’s 10.0% jump to 4,846 units and Hino’s 79.1% spike to 564. These gains offset FCA’s 15.0% plunge to 1,705 units. Ford held the No.1 spot in the class all year long, ending with a 63.0% market share and 9.9% gain over 2016. Class 4 continued to outperform any other class with demand jumping 30.3% to 2,328 trucks. Last month marked the best December since 2009 when 2,519 trucks were delivered. Hino was the only truck maker to decline, falling 8.5% below last year with 104 units. Mitsubishi Fuso saw the greatest improvement, soaring 710.0% from 15 to 117 units. For the year, Ford claimed first place with a 24.3% rise in sales and a 15.4% market share. With domestics and imports climbing 700.6% and 469.2%, respectively, GM grew from a 1.7% market share in 2016 to 9.3% in 2017.